In a recent conversation with a young entrepreneur I was asked about the word(s) I would recommend that he study. I came up with three in a minute or so. Randomness: Accepting the brutal reality of knowing your influence on events may be outdone by forces beyond your control. This knowledge requires stoic resolution to accept that despite your best efforts the goal will not be achieved. But: progress may just as likely be favored by these same random forces. Roll with it. Leverage: To make progress quickly with little or no power you need to create an amplifier. Look for them - they are a gift of nature the way a natural amphitheater allows a voice to be heard 100 yards away. Usually you need to trade risk for reward the way mechanics converts velocity for power. Entrepreneurship is the craft of leveraging ideas into movements. Networking: All success flows from the impact of ideas on people. People tend to share ideas within their tribes - social networks. The goal of an entrepreneur is to spread an idea among tribes using the natural tendency of the members of that tribe to communicate. The influence of an entrepreneur is thus leveraged by the interconnections within these networks. The world seems to be coming apart at the seams. Every day brings stories about violence, corruption, disharmony and polarization. The news media gets paid to bring stories like these into our living rooms and to the front page of our newspapers. Mobile consumers have this unhappiness delivered continuously to their devices a dozen or more times a day. Bad news today travels even faster than it did when my mom warned me fifty years ago that bad news travels fast. With this tsunami of tragedy, even the most hopeful soul could feel down by the end of the day. Today is December 1st. The beginning of the Holiday Season celebrated around the world by three great religions and over half the Earth’s population. A time of joy and hope we need throughout the year but especially now. If you are person of faith, you have these happy holidays to celebrate. I propose that rather than wait for January 1st to make a new year’s resolution, you make one right now to seek out and find good news every. It will make you more optimistic, creative and energetic; even less stressful. Doctors say it will improve your immune system! Think of the impact on your love life! And when you hear about polarization between peoples or politicians, I want you to think about this kind of polarization - North Polar-ization! We can all agree that this time of year is enjoyed most by children who dream happy thoughts of gifts and giving. We should pay more attention to them than the news. This article (Politics and the New Machine) which appeared in the 11/16/15 New Yorker magazine, presented very troubling evidence that the polls with which Americans seem so fascinated are at best untrustworthy and at worst a fraud perpetrated on us by pollsters who know they don't represent electoral views. Even worse, they may actually be corrupting the very purpose of the electoral process. We don't have time for details. We aren't interested in stories, just summaries and aggregates. The convenience of a number trumps the work required to understand what it really represents and its potential irrelevance to an individual case. The statistic belies the assumptions, trade-offs, biases and prejudices. Big data gives us the ability to collect more information, but humans can't process it anyway. Get ready for more approximations. I read Doug Stowe's Wisdom of the Hands blog often and am always inspired by his thoughtfulness. Doug is an educator and woodworker in Arkansas and amateur education policy historian. This week he wrote a blog post which explains a turning point in vocational education policy evolution...well worth the read! I presented our vision for an Indiana Advanced Manufacturing Certification (IAM-Cert) credential to about 25 students at Atterbury Job Corps on Thursday. Young men and women enrolled there are learning trades at this residential facility in central Indiana constructed as an internment camp during World War II and repurposed to offer vocational training to students for whom 'regular school' didn't work. Construction & building trades at Atterbury are promoted as a pathway to secure employment, good wages and a higher quality of life. It is ironic that very few students today are encouraged to pursue a career in Manual and Industrial Arts when the pride and satisfaction of making things so obviously leads to a 'virtuous cycle' of learning and improving one's skill and value. I found Doug's post today recounting a key turning point in the evolution of our current education system very interesting; particularly with respect to the political compromises between the two powerful forces of industry and labor. Today, the education industry, supported by a $73B federal DOE budget, and state budgets which in Indiana account for 63% of state spending, represent a third powerful constituency. Nobody should be surprised that it has incredible influence over policy. How then did Industry, Labor and Education allow the state of our schools to veer so far from what works? Was it complicity or incompetence? Selfishness or a simple misunderstanding? More importantly, how can we change the status quo? I'd like to help. There are a continuum of jobs in this world. Like snowflakes or fingerprints - no two are the same. But there are categories and within them are starters and finishers. I've always been a starter. I love to think about the possibilities and like a bridegroom focus on the excitement of a new life together with my bride - a fresh idea. But life is not an endless honeymoon. The birth of a child leads to an existence which is mostly less effervescent in emotion than those first few days. Somehow regulation and order move in to replace excitement, reality replaces possibility. In business this notion is one of creation vs execution. You need both, but it is widely regarded that owners and investors are better served by a good executioner than a creationer. At this age I'm reconciled to enjoy the start-up phase and do my best there. Recognizing that's not for everyone means there are executioners that love the fulfilment of the dream more than the dreaming. Good for them! With my latest venture: 1stmakerspace.com, I hope to assemble a team with all the talents optimised for each stage and need of the business. People do best what they love - shouldn't a start-up be filled with lovers of what they do? I'm an entrepreneur and believe ambition, investment, creativity, risk taking and hard work are elements of a personal success strategy. There is no magic formula - and my friends know I believe LUCK and TIMING are the most important contributors to business success - but over time those five attributes will help start and grow a business. So how do we share this success formula with more people? I believe growing your network and learning from other entrepreneurs are critical too. Home grown businesses may not be as flashy, but small businesses employ more people and can elevate more employees to employers. As a society, how do we create more employment, self reliance and prosperity? My answer: help more people start and run successful businesses. Government programs can be useful, but my idea is for neighborhood businesses to help neighbors who want to start a business by contributing the capital and knowledge it takes to get a business off the ground. With a tax break targeting those investments, businesses who are motivated to help a local entrepreneur can make a contribution to their success both financially and with nurturing advice, networking connections and tough love when needed. Not every business will succeed. But with a competent adviser who has skin in the game and the entrepreneur's interests at heart the odds will be much better. The neighborhood wins. If the new business fails - hopefully it will result in lessons learned and without the crippling debt and impact on credit scores that can happen when personal credit lines are stretched and then break. If the business succeeds, the profits will be shared with investors and perhaps can be sheltered from income tax for a while to sweeten the deal. Hopefully, a virtuous cycle will begin and generations of prosperous business owners will transform a neighborhood, a city or our country - just like they always have. We've been so busy developing the 1st Maker Space business that I haven't had a chance to post here. The VR vs R post just written was the exception. We've had some great press in the local media I wanted to share. Maybe Blogger counts for something in the SEO world. My grandson being interviewed by Jared Council, a reporter with the IBJ. Ethan, 9 years old, is explaining how 3D printers work. 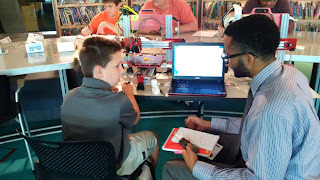 Someday, every school with have a maker space! As a member of the 'maker' community I'd like to reflect on why reality is better than virtual reality. True, programming for apps is all the rage. Code.org, among other organizations, like Eleven Fifty here in Indianapolis, make the case that every child should learn computer science. I did. Coding is cool. It allows you to control a little machine, which, can be connected to a large machine, the Internet or even a human being. These little machines are cheap and the software is free. Learning to code requires study, concentration and cleverness. What's not to love? The problem I see is that these little virtual worlds don't have to interact with the real world. The real world - reality - is a far more complicated place than manufactured worlds. How do I know this? Just try to make something. Drilling holes, assembling components, building anything forces you to interact in a reality zone where inconvenient facts intersect with your ideal design. Ninety degrees becomes 89.5 degrees. Parallel isn't. Attachments and joints wiggle. Inertial effects impose themselves when gravity and motion affect structures. Algebra turns into calculus. Problems may be dismissed or their effects postponed in a virtual world. You can ignore tolerances and stacking errors in these ideal places. Not so in your garage. Sawing pieces of wood intended to form the sides of a box, (a simple rectangle morphs into a parallelogram,) is humbling. A craftsman's skill is not earned in a semester at a coding academy. Coding encapsulates its own reality. In the virtual world of a micro-controller the 'state-machine' executes instructions with predictable efficiency. The machines were designed by humans with economy and utility in mind. The goal is to simplify problems and optimize predictability. Reality, on the other hand, is anything but predictable. 'Making things' as it turns out exposes the designer to a plethora of unexpected problems: material properties, dimensional inconsistencies, variable loads, unanticipated defects, supply issues, finishing, light, shadows, static electricity. There is no order to these problems because in the real world there is no order to the problems. That's why it's called the REAL WORLD! With all due respect to my friends in the software business, you deserve the billions of dollars you make moving bits around to the endless entertainment of consumers hungry for vicarious stimulation. But as for me, I'd rather be making something. A spontaneous photo from Conner Prairie, the local, interactive, outdoor museum that partners with our 1st Maker Space program for schools. 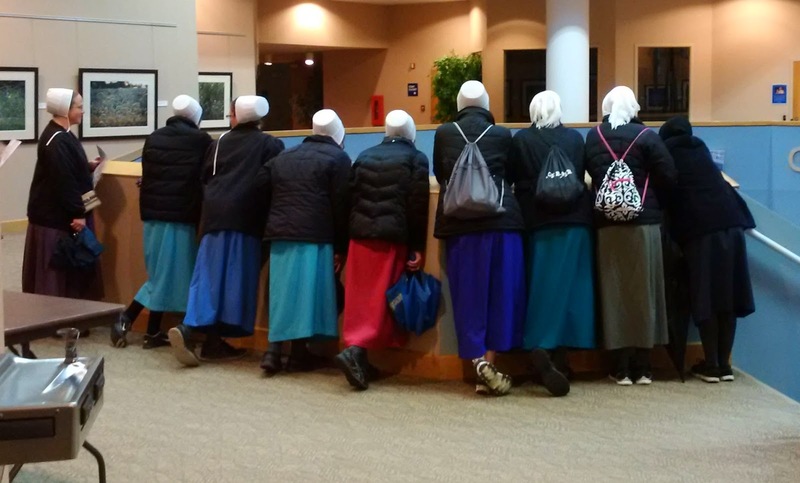 I was walking down the hall from our exhibit and saw these young Amish women peering over the mezzanine wall down to the first floor. It seemed like a paradox of old and new frozen for a moment in time. Had to share. Quality control or political power grab? As a member of the manufacturing community I've learned that Quality Control is a Science. Lots of math, lots of documentation, lots of training and lots of measurement. But we don't measure EVERY part. It's called statistical quality control because we use statistical sampling to asses the quality of our process. High stakes testing of students hasn't seemed to figure this out. This intrusive, expensive, impractical and meaningless methodology has created a financial windfall for test vendors, income for a test-prep ecosystem surrounding it, untold stress and anxiety for students and their parents and a political football for incompetent legislators. What could possibly go wrong!!?? I found this show on CSPAN describing the rising tide of dissent against this insanity. I thought you'd want to watch it. Fascinating! 1st Maker Space Making Progress! IPS and Ivy Tech have committed to hosting 1st Maker Space summer programs. Those 1st Maker Space partners represent the largest school district in the state and the largest commmunity college in the USA. The Arsenal Technical High School 1st Maker Space is under construction. We've already had a stream of 'maker space tourists' come through and leave very impressed. Pre-registration for our summer camp programs, now hosted at over 20 locations, have accelerated. We will be exhibiting at the Indiana Afterschool Network 2015 Summit 4/13-15. We are constructing a maker space in the center of the exhibit atrium at the J W Marriott. Typical attendance exceeds 700 educators and includes school decision makers throughout the state. The keynote speaker is Don Wettrick, Innovation Specialist at Noblesville Schools and author of Pure Genius: Building a Culture of Innovation and Taking 20% Time to the Next Level. He was instrumental in arranging for 1st Maker Space being selected by Noblesville Schools to build a maker space at their high school. We will be hosting camps there this summer. And this week we'll be cheer leading for Cardinal Ritter HS at the NCAA Final Four. They were one of four Indiana schools picked by the NCAA to receive an award at their Team Works Celebration. Ritter invited us to be a part of the ceremony in appreciation for the support we provided them in the construction of the artificial hand they provided to the little girl in Toronto as part of the Enabling the Future program.